The Bandsmen, aged 16 to nearly museum relics (we're keeping some secrets), and dressed in their various colourful costumes, have "perfected" a unique blend of music and crazy comedy antics. 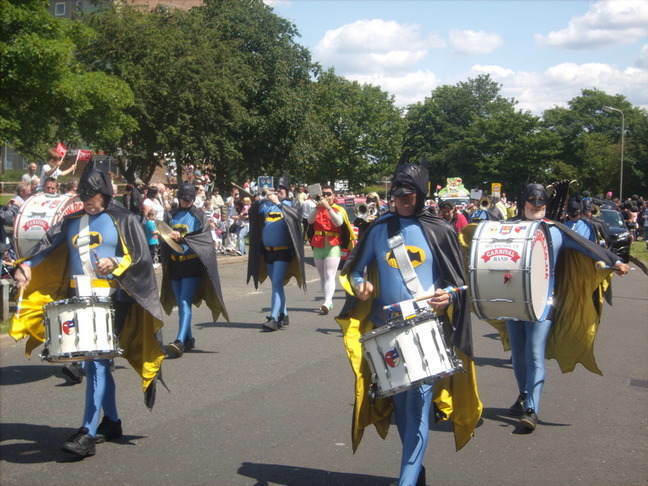 This, combined with their marching routines, ensures that the band is always in great demand. Drums, brass, bugles and bell-lyras (similar to glockenspiels) provide the means to play a wide spectrum of musical styles from Traditional Military, American Marching Band, Pop, Swing, Jazz, Disco, and Latin American. All musical arrangements and comedy routines are developed by the band members themselves. Various props and theatrical explosions are used to enhance comedy performances. The Band has appeared at Carnivals, Fetes, and Shows throughout England, it has toured Northern France and by invitation has appeared in the prestigious Jersey "Battle of Flowers" on six occasions. The Band has performed in the Lucerne Winter Carnival in Switzerland twice, and was the first ever British band invited to participate in the 100-year-old event. Other noticeable appearances include:- A Youth Band Festival at the Royal Albert Hall; Mr Punch's 325th & 350th Birthday celebrations in London's Covent Garden; the London Christmas Parade; the London Taxi DriversParty for Under-Privileged Children, at Grosvenor House Hotel 22 times, including January 2015; Glastonbury, Bridgewater and Leyland Carnivals all with return requests; several tours incorporating major carnivals in France at Valenciennes, Douai, Croix, Comines and Lille; seven visits to Guernsey for the island's Liberation Day celebrations including the special 3 day Millennium event. In September 2014 we revisited Valenciennes for an unprecedented 4th time by special request. By invitation we took part in The Lord Mayor's Show in London in November 2001 and again in 2008, also we have taken part in the Old Gaffers Festival at Yarmouth on the Isle of Wight for the last 14 years. To its credit, the Band has mademanyhilarious T.V. appearances with well known stars and personalities, during it's 30 years of fun and music making. The most recent appearance, in December 1999, was with Lulu for BBC.TVs' "Red Alert"(National Lottery) Show, with the band dressed as Santa Claus. In October 2000 the band designed, produced and directed it's first highly successful well-acclaimed Stage Show "Musical Mayhem" at a local theatre. 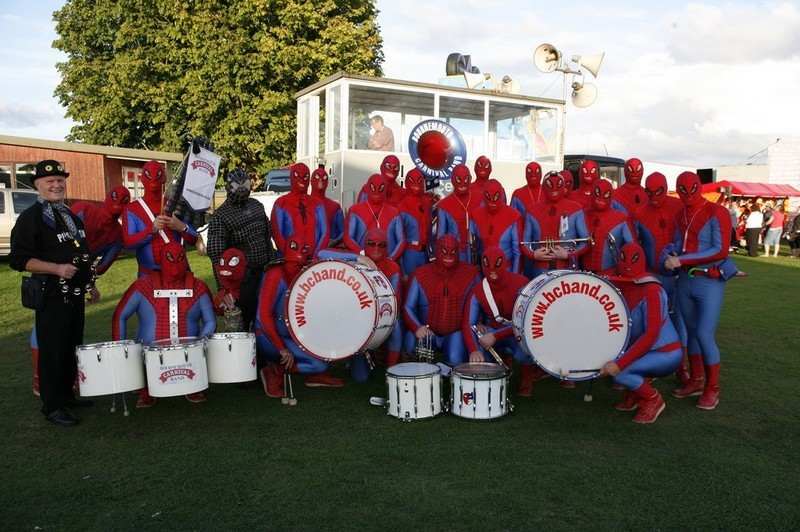 Although most famous for their bright red and blue Spiderman costumes, the Band has performed in other outfits including "Funderbirds", with our large Lady "P" and Parker; Mutant Hero Ninja Turtles and Snowmen. These last 3 costumes are, unfortunately, no longer available. 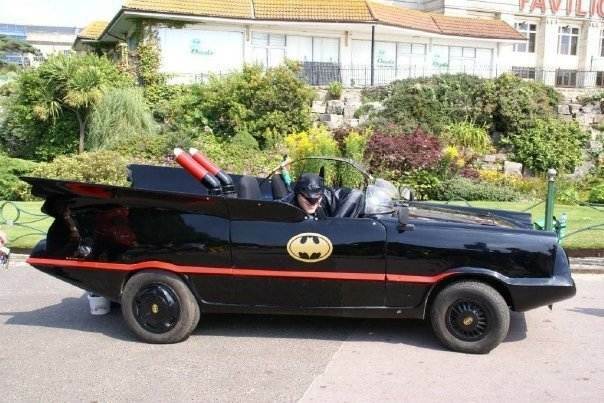 With the exception of Spiderman, these have all been superseded by a striking Batman costume, complete with an oversized Robin, villains Penguin and Riddler, all complimented by our own "Batmobile" and Punch & Judy including many of the other characters from the story. 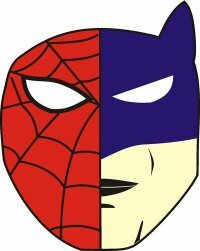 New costumes, along the themes of "Superheroes", are always being considered. For completeness, in true carnival spirit, the colourful Band car and trailer are used to support the Band. Why do we do it? The Band's main aims are to assist and help the fund raising of worthy causes, especially those concerned with children having special need or physical handicaps. Also to generally assist other charitable organisations, and support and encourage youth bands in their efforts to promote musical knowledge and expertise. Usually, at most functions, an appearance fee is requested, but at many charitable events the services of the Band are provided free of charge to help maximise funds contributed to the worthy cause. Asthe band is a registered charity, the bandsmen receive no payment for their time or efforts, but gain only the pleasure from seeing others enjoy the shows. 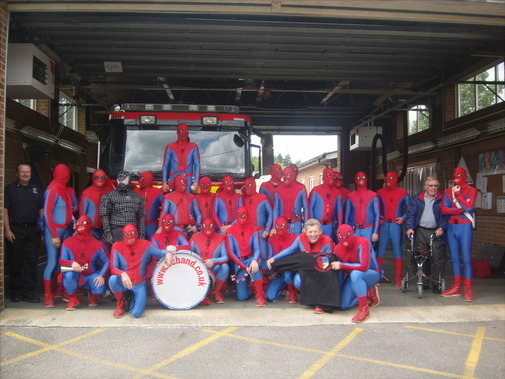 Most importantly the Band enjoys all that it does, and when out entertaining, in all weathers, it is at it's happiest.